I enjoy some cleaning, like bathrooms and dusting. I do enjoy cleaning. I find it rather relaxing and fun! I’m learning to relinquish that, too. It’s not easy. LOL. Congrats on your baby on the way! Do you know the gender? I’m sure! Does your 2-year-old understand that another baby is on the way? I’m guessing he/she is probably a little too young to get it right now, but I’m sure there will be a lot of excitement when baby arrives. I do wish I had the urge to clean more! I do like to have things organized, but its hard to actually get to that with three little ones, but one day I imagine everything will get clean:) But theres a saying that says – one day all the dishes will be washed and all the laundry folded and put away, but your kids will be all grown up and gone. So enjoy these small moments with your kids, even if things are messy for a time. I love to clean too but now with three kids and homeschooling my house is never as clean as I would like. I’m slowly learning to live with it never perfect. I really don’t love cleaning but have to constantly with 2 little kids and a cat, especially since we have pretty bad allergies. This might be different from others but I wonder if anyone out there feels the same as me. When my grandpa who meant alot to me passed 2 years ago I stopped caring about my home and stopped doing most of the cleaning. I do bare minimum now and most weeks always have a dirty home including floors dishes the tub, all of that. Id love to pay someone to come to just even get it clean again. Ive also got boxes of stuff from when he passed that I dont think I want anymore bc I dont want the clutter. I miss him terrible and so does my son who thought the world of his great-gpa! I function much better in a clean, tidy home! I love hearing about good cleaning products. 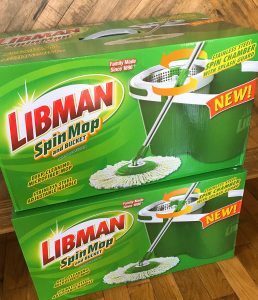 I’m going to try the Libman wonder mop. I’ve never heard anything about their products. Are there any other cleaning products that you like to use? I like the results after I clean but I’m not a cleaning fanatic. I can sympathize as well Ellie! I love for my house to be clean. My biggest hang up is having it clean before we leave on a trip. It’s hard to get out the door because I want to come back to a clean house😉 But like a lot of the commenters I have small kids so I’m learning to let go a little. That hasn’t been easy! Yes, I agree. It’s also much easier to pack for a trip if you don’t have stuff all over..and easier to avoid forgetting important things. It sounds like you might have a condition that is called Obsessive Compulsive Disorder. Your symptoms sound just like it. How rude to both Ellie and to people who actually have OCD! OCD is so much more than wanting a clean house. It involves horrific intrusive thoughts (obsessions) and performing repetitive acts (compulsions) to relieve those thoughts. Compulsions can range from cleaning to repeatedly checking to make sure the door is locked to self-injury. Please educate yourself more about these issues before making such a statement. I use to love cleaning but now I don’t since . I hate doing bathrooms. I am the same way. I can’t relax when the house is messy. I like things clean and orderly. I have six small children so things don’t stay organized at all. And it’s not always clean. I do clean all throughout the day and it’s clean before we go to bed. But I hope my children don’t remember their childhood as being all about cleaning. I have a hard time with this still, and I’m a work in progress. But some things are more important than others. Thank you for a chance to win. I am needing a new mop. I am learning to love to clean as I love when things are clean. I’ve been doing lots of decluttering and now I look forward to it. Good for you, Samantha! It’s good exercise, too. I can totally see why the FBI wanted to recruit you. I do enjoy cleaning but most of all, I enjoyed how the house feels after cleaning. I know someone is extremely clean and has hired a weekly cleaning lady all of her life. The funny thing was when there was a bed bug epidemic. It got into that upper class and somewhat pretentious area. would suddenly turn your extremely perfect world upside down and leave you devasted? One time when I was busy reaching for perfect, I was at a coffee shop and left my wallet beside my purse while I hurried to look for a bus time on my phone. I thought that I just had to catch the very next bus and could not take time to be careful or wait for another bus. Then someone passed by and snagged my wallet. I did not imagine I was making a big mistake and giving an open opportunity to someone. Now I regret trying so hard that I errored in judgement. Calm down and try to control your impulse to be so perfect. It is not really your friend, because pride goes before a fall and a haughty spirit before destruction. Sorry if you think I’m judging you, I’m not really I just see that when you focus so strongly on some small insignificant thing that you are out of control and out of your perfection zone, that you can’t control yourself, something could go very wrong in that attitude. You need a more Holy sabbath rest attitude where you only focus on God’s good and let other profane things go. That’s when you are more likely to see what is the true good and seek it no matter what. Having a lot of pride in a perfectly clean house is not going to help you if you were so out of control of your soul that you obsessed on the house more than something that really mattered. My aim for myself should be what Jesus said, keep putting first His kingdom and His righteousness and everything else falls into place. Honestly I’m still challenged to know just what that is. Lol, you sound like me. I have a hard time leaving the house unless it’s all tidy. I hate coming home to a untidy house. And if my closets are unorganized, I feel like my household is falling apart. Over the years I have had to learn to let go a little bit, because with 4 kids, obviously it can’t always be tidy, but it was a steep learning curve, and I still cringe if they make a big mess, but I also try to let them make messes so that the only memory they have of their little years is not Mom nagging them all the time to not make such a big mess. Here is an example of what an awful person I became being clean. It was my daughters 16 the birthday and we took her and her friend to a food buffet. There was graffiti in the washroom, cracks down to the foam on the chairs, stains on the table cloths, etc. Dissapointed I complained and embarrassed my daughter. But we did get a free pitcher of pop. My mom had 3 kids 3 in a half under and had no problem keeping the house clean. That’s good for her. I’m sure she had a system that worked well. I have six kids all under 8. 3 kids are 3 and under. We homeschool so we are home all day. And I do keep the house clean but I hardly ever sit down. I’m trying to relax more. And take more time to live not just clean. Life does get messy and so does homes. Especially if homes are lived in they get messy. But it isn’t always easy cleaning. When you clean one room it doesn’t take much to mess up another room. I have one girl and five boys and they aren’t as motivated to clean as my daughter is. I don’t think a dirty, filthy house is acceptable. But a house that is lived in shows signs of life. And I love cleaning and having a clean house. I need to do a lot more cleaning. I don’t mind it so much , when I actually get started. The mop sounds as if it would be very helpful. Having our house clean feels so good, but I get weary of doing the cleaning. Older age problem? Then by your conditions, God must never get to sleep easy, while much of His world is a mess. But at least your house is a Haven of peace and order, so He catches break there. I’m not as obsessed with cleaning as you 😉 Lol But I do enjoy doing a good deep cleaning every week or so! I enjoy cleaning everything but the toilet. I enjoy some cleaning. I am always looking for a better mop. Cleaning is not my fav…..but who truly loves it! I would love a new mop!! My current one is awful! The mop heads on it for not last long before they break or come apart. It’s very frustrating! I don’t like cleaning at all. I have searched for something that does a good job and so far I haven’t found anything that works very well. I am thinking if I got some products that can help me to do a good job that it might help me. 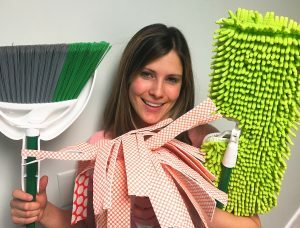 Cleaning would be more fun with these fun products! I have a hard time cleaning because of my back. I have a really bad back. That hurts me 24/7. So this would help me so much. I would love to win. Is that what there wearing for the New Spring Line in Paris, lol!!!!! Take care, and how is your little guy doing??? I really hope all is well with U guys, and I love U 3!!!!! Haha. The little guy is doing well. Thanks for asking! I like decluttering, but not cleaning. Hi Ellie, Thanks for your contest. Cleaning is a fun contest. The older I get, the less I have the energy for cleaning, and the more I let things go. Luckily, my husband insists on helping, now that we are retired. I am like you. I had a friend tell me once that cleaning helps you feel like you have your life in order. I think that’s probably true. I especially don’t like any kind of major cleaning hanging over my head. I will not go to bed with any kind of mess awaiting me in the morning. And if I leave the house, I want things straightened up, at least, so it’s in order when I get home. I am like my mom was. My daughter is the same way. My biggest downfall is that in cleaning up the mess, my drawers, cupboards, and closets are a disaster. Sadly, organization is not one of my gifts. I do not enjoy cleaning, but like to see the end result. My grandmother was always cleaning and cleaned for a living after she retired! I am trying to be more like her in the cleaning department. I enjoy cleaning a lot! It’s a stress reliever for me! I enjoy the results more than the actual process. I don’t love to clean in general, but I do enjoy cleaning aluminum faucets and seeing them gleam lol.